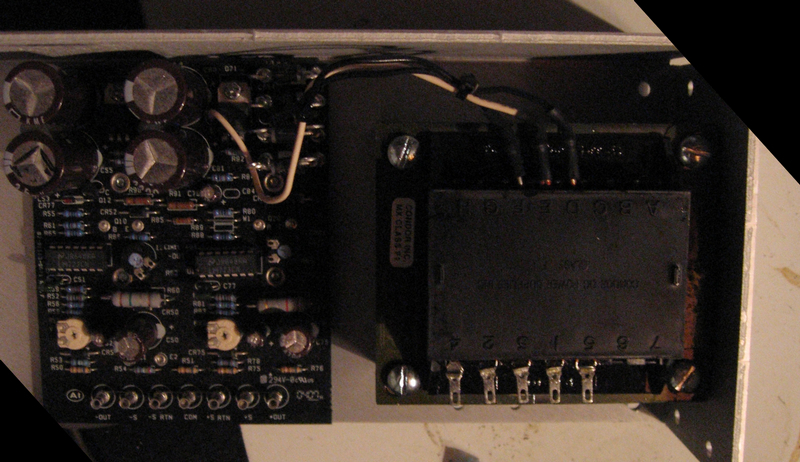 since the PSU outputs +15V AND -15V referenced to COM (or ground), it IS a dual output supply. if it would provide additional 5V we would call it triple output. anyways, i am glad if i was helpful. you are more and more helpful with every post! this is great info, thanks!! I've just been getting started with Power One supplies (HAA15s) and found this thread and Fonik's info to be darn useful! So, I don't know what conclusion to draw... Does this perhaps negate the need of adding the extra jumpers? I'm still go to add then anyways I think..
Also just to note: on the HAA15s it says (on the case and in the docs) to cut cumpers VW1 and VW2 for 15v operation. Hm, I don't have the sensing terminals connected to anything and the supply (an HAA15) seems to work just fine.. Anyway, does anyone know of a good way to supply power to the 5v rail? I wanna get my feet wet with some digital modules but I'm at a loss as to how to power them. Does anyone know about how many modules the Doepfer "low cost" 5v supply will power? Thanks! I've wondered why if it's 'better' to have the sensing terminals connected together, why they even provide the terminals in the first place instead of just connecting the circuit points up by default? Is it so more sophisticated power monitoring/controling gear can be connected or??? They provide a schematic too if you want to roll yer own. Similar circuits can be found. It's not mine and I don't know the seller so, you are on yer own! it's just because real remote sensing would connect the sensing terminals not at the PSU but at the load. it's the voltagedrop caused by the resistance of the leads that needs to be corrected. in our case the leads to the load are not that long, so it doesn't seem to matter. again, the quote above is a disclaimer, i think. so it all depends on several circumstances: how long and/or thick are the leads from the PSU to the load (i.e. power distribution boards) and how much current is drawn? the less current you draw and the lower the resistance of the leads, the less voltage drop we will see. if you have a closed system which draws the same current all the time you could just use the trimmers to set the correct voltage. in my case i start building a cabinet and then i add modules over the year, and i don't want to readjust the PSU again. And sorry, I failed to go to the link you provided earlier. Makes more 'sense' now that I read it! if you wanted to use a power one PSU (which is a good choice, i think), don't forget to wire the sensing terminals to provide (remote-)sensing of the PSU. this will guarantee the same regulated voltage output, no matter how much current is drawn by your modules. otherwise the output voltage could drop, depending on how much current is drawn, each module that you add to you modular could influence the output voltage of the PSU (this may influence the tuning of the VCOs). so connect the sensing terminals to the corresponding output terminals. connect your power bus/distribution board direct to the output terminals, not the sensing terminals. hi matthias, welcome! good to have you show up over here and hang out. ive seen you recommend this PSU configuration over at E-M before. have you tested rail stability with both sensing and non sensing configured? the feature sounds nice but i wonder why this practice would not be more well known and used if it led only to higher voltage stability. at any rate, i know that paul/synthtech does not configure his PSUs this way. i cant remember if .com does or not. i did no measurements, i just followed the instructions given in the PSUs documentation i got. as said before the voltagedrop depends on current drawn and resistance of the leads. the wiring in our synthesizers is very short, i'd say. so it won't matter much, i guess. if one experienced problems he could use larger gauge to lower the resistance. consider that these PSUs are used in medicine and aviation as well. the wiring in an airplain might be a different thing! maybe i will have enough time on weekend to do a measurement - just for fun!? It looks like from the pictures on their site that synthesizers.com wires up the sensing terminals. I just took my PSU out to hookup the sense posts..
.. and it WAS done at the factory it appears. There are thin wires connecting the corrects sets of posts that appear to be original, not soldered after the fact. and as far as the multimeter is concerned, they are definately joined. i measured the resistance of the leads i use for connecting my PSUs to the power distribution boards. the gauge of the leads i am using is about 0.5mmÃ‚Â². i measured 0,5R/m. say the leads are 20cm from PSU to bus. that would be 0,1R. if i power some modules with 500mA in sum on a rail this would be a drop of 0,05V (R*I=V). if i then added more modules that draw 1A in sum i would have a voltage drop of 0,1V. the remote sensing should take care of this 0,05V difference. i could use shorter leads or leads with larger gauge alternatively. the 0,05V change in supply voltage could influence the tracking of the VCOs or the tracking of the outputvoltage of a midi2CV module, i think (depends on, i know). anyways, this all does not apply to a closed system. here you could set the output voltage by the trimmers and leave it as is. just one comment, though. AFAIK and according to the documentations i read, the ground (coming from the AC mains connector) should be connected directly to the PSU chassis, as close to the transformer as possible (usualy there are holes for screws in this area). 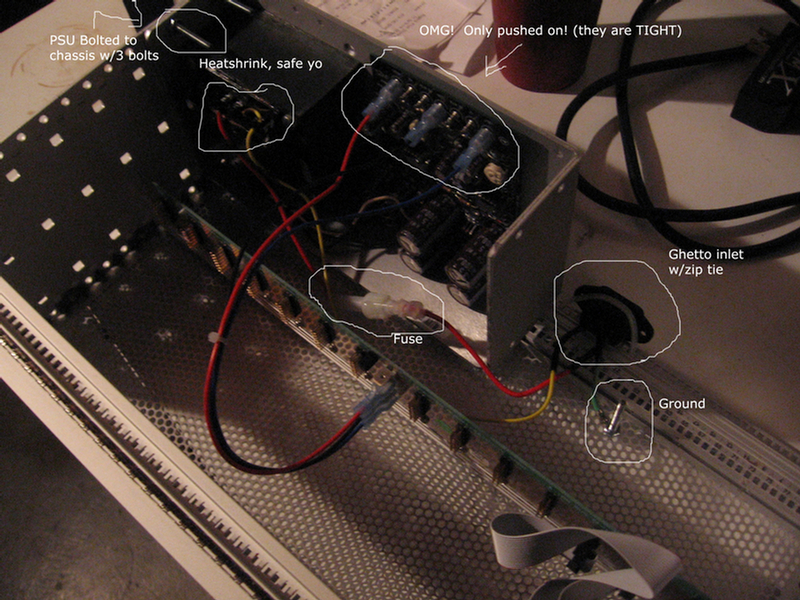 the PSUs chassis is mounted to the rackframe, so the cabinet is grounded as well (protection class I). it is a protective earth conductor that is not needed for your PSU working properly. in case something goes wrong inside the unit and lethal current would go to the cabinet/controls, the protective earth conductor leads away this current. In case (and only then) the whole case is made of plastic and all controls (knobs, sockets) and the faceplates are made of plastic, if no conductive parts are reachable for the user, then and only then you can even leave the ground off (protection class II). this will apply to our DIY very seldom, i guess. Thanks so much for this informative posting! It is because of this posting I have joined this forum. What kind of connectors do you have for the individual wires connected to the DC posts (where you say OMG only pushed on!)? Anyone know a part number/manufacturer/Mouser #/etc? unfortunately I do not know what the 'correct' technical name for the connectors is - 'slip on connector'? And I'm not sure of a part number.....they simply came along with my Doepfer busboards. muff, you were able to put the flat push-on connectors onto the round DC posts? i dont remember receiving round push-on connectors with my DIY kit, i cant imagine forcing the flat ones. i know that round push-on crimp connectors exist and *may* work with those posts, but ive always only soldered wires into them. took a bit of work, but yeah. If anyone happens to have any info on those and if/where they would be available in the U.S. please let me know. I could just solder wires there but would feel better if they were covered with connectors like they are on yours. Another question - what gauge wire did you use to connect the AC inlet/mains power to the primary side of the power supply transformer? Would it be ok for me to use stranded hook up 24 AWG wire, for example? Should I use something heavier on this side of the power supply? you can also just apply some shrinkwrap over the DC posts if you dont want them exposed. this is a good idea when wiring your AC mains to the PSU too. what gauge wire did you use to connect the AC inlet/mains power to the primary side of the power supply transformer? Would it be ok for me to use stranded hook up 24 AWG wire, for example? Should I use something heavier on this side of the power supply? larger is better, i'd go for 16-20g. more importantly-- get wire rated for your AC mains voltage! do NOT use regular old hook up wire between the wall and your PSU. the danger is that the insulating layer could disintegrate and leave you with mains wiring exposed. most hook-up wire is not rated for higher voltages. i had a conversation with one of the guys at the local electronics store about this. i ended up buying a heavy duty three conductor power cord and chopping it up. it worked out nicely.